A slightly revised version of an article titled “Elections and naiveté – Dreams of change and their unexpected aftermath” published by The Telegraph, Kolkata on 6 May, 2016. The Holy Roman Empire – which, according to Voltaire, was neither “Holy”, nor “Roman” nor an “Empire” – lasted for a thousand years. And it took an insatiable Napoleon Bonaparte to bring it to its knees. By comparison, three decades and a half of Left rule in the state of Bengal would appear to be infinitesimally small, though it had managed to be viewed by all concerned as the Holy Bastion of Marxism during its tenure. No Voltaire was around to pronounce judgment on its Marxian virtuosity or its holiness for that matter, but few ever doubted the impregnability of the fortress. Yet, it was razed to the ground, and that too by a sundry political force, lacking any political philosophy worth noting, apart from its one point agenda to dislodge the Left. But it did have a mini-Bonaparte of sorts to chalk out its battle plans, beginning, among other things, with a much advertised fast. The year 2011 might be compared to the year Napoleon won the battle of Austerlitz. It was the year the leftists succumbed under the sky resounding call for paribartan. 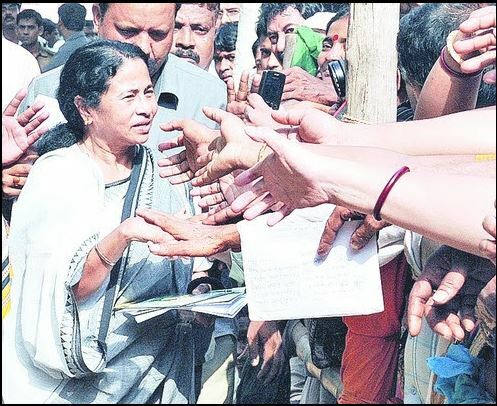 To the extent that paribartan stands for change, it is not entirely impertinent to ask what it was that the Bengal electorate rushed forth to transform. Was it a political power that Bengal, especially its intelligentsia, wished to replace by another? Or was it an attempt to exchange one romantic dream for another? Before addressing this question, however, other issues call for attention. The arrogance of the left and the superciliousness it handed down to those who failed overtly or covertly to tow the party line is far too well-known to merit discussion. Its conceit was meticulously doled out to the cadre in the shape of half-digested Marxist jargon. This columnist recalls for example the verbal torture he had to endure once at the hands of the babus of the Kalyani University administration during a train ride to Sealdah station. The inquisition he was subjected to concerned the academic discipline he was associated with. The subject being Economics, and not Physics or any other natural sciences, the cross examination was intense, as it brought up questions relating to the links between Das Kapital and the Economics courses students ought to be taught. The incident described could not have been a solitary experience. Endlessly many had been subjected to such humiliation for the unpardonable crime of not chanting Marxist shlokas at random or, for that matter, not raising their fists in tandem with ear splitting lal selams. While the Left Front’s messing up of industrial growth was a cause of disenchantment therefore, there were other reasons too which might have peeved the voters in the state, especially those who didn’t lack the education to argue on their own. Unfortunately though, such persons were in the minority, given the Left Front’s policy of combining deindustrialization with the creation of brain dead supporters. Nonetheless, the state of affairs could have continued to be in situ and the state might still have been under the Left Front rule, had it not been for two vital factors. The first of these of course was the Nandigram incident. At its height of power, the government had engaged in far greater violence in Marichjhapi. However, unlike Marichjhapi, Nandigram involved police firing on people who were unquestionably settled in West Bengal. Who was it that issued the lethal order was irrelevant. It was undeniably the police that had fired the bullets. The hypnotic power of the red rule was evidently shaken by its own colour. The colour of blood, extracted by gun wielding policemen. For the first time perhaps, rural Bengal began to think for itself. The Messiah, if not obeyed, was capable of resorting to tyranny. The Chinese government can get away with a Tiananmen Square, but not the Left Front in West Bengal. Decades of unquestioned rule notwithstanding, the fact remained that India’s democracy required a government to be elected every five years. It is easy enough to argue of course that political opponents had cunningly organized the suicidal mass movement in Nandigram. Such arguments, if correct, merely strengthen the perception that the Left Front’s influence was on the wane. What needs to be further emphasized is that the forceful acquisition of land in Singur left to itself, would probably not have caused the havoc that Nandigram did. The second, and possibly more powerful factor that added fuel to the fire was the role played by civil society. As argued above, a section of the intelligentsia was anti-Left in any case. They were now joined by the Left defectors as well. Poets, novelists, well-known personalities from the world of entertainment took up the cause. They used their oratorial skills, the might of the pen, TV panel discussions and protest marches to bring down the ruler. And they lent their support to a candidate who had even fasted in the interest of the oppressed, even though the person’s political ideology remains unclear till this day. The change did come about, a monumental change, way beyond the realm of possibilities ever contemplated. It is not difficult to guess what the rural masses expected of this brand new government. Return of Singur land perhaps, clean drinking water, negotiable roads, occasional visits from the freshly elected and, most importantly, jobs for survival. However, what had the urban intelligentsia asked for? Was it a new political philosophy that it had hoped to emerge? Probably not. The events preceding the 2011 Left debacle were unlikely to have aroused political thoughts in the minds of those who were expected to be capable of thinking. It appears as though that civil society was absorbed in playing out a fairy tale, involving the choice between good and evil. The Left was identified as the evil and the opponents as good. The much applauded paribartan was a clarion call for the arrival of the good. History in Bengal, it would seem, followed a reverse course! It is well after 2011 therefore that the renowned personalities, who had sung paeans in praise of MEP (reminding one of Beethoven’s dedication of Eroica to Napoleon) and inspired the public to shoo away the Left, are now lining up before the Election Commission with complaints against their darling and idol. The Good Samaritan has spent five years since 2011 to lose the warm glow, and is viewed now by the intellectual admirers as neither Good, nor a Samaritan, but simply as a politician hankering after power, not unlike Napoleon once again. Confusing a politician with a Good Samaritan shows depths of naiveté to say the least. MEP may lack philosophical underpinnings, but not the ability to engage in strategic planning. The intelligentsia too has produced its own supply of turncoats. A new breed of self-seeking intellectuals has emerged therefore to keep MEP rolling. As Orwell might have observed, the creatures outside, not excluding civil society itself, are looking from MEP to non-MEP, and from non-MEP to MEP: but it is impossible to say which is which. Perhaps Bengal has merely reached the thirty-ninth year of its own Holy Roman Empire.